To help football fans celebrate the European Championships 2008, you can now use Google Transit and Google Earth to navigate around the tournament in Austria and Switzerland. Using Google Transit, fans will be able to use Google Maps to plan their tournament travels - from finding tramway stops and the nearest bus stop, to finding departure/arrival times. To find your way from one match to the next simply click on the 'Get Directions' link within the Stadium details in the European Championship Fan Map. We have coverage for all participating cities including Innsbruck, Wien, Salzburg, Klagenfurt, Basel, Bern, Geneve, Zurich. Data for Google Transit is provided by SBB and VBZ in Switzerland and by ÖBB in Austria. These are the latest additions to the Google Maps transit trip-planning service, which already includes more than 50 cities in the U.S., Europe, and Canada. 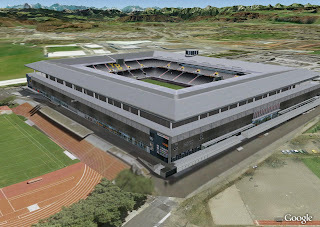 We've also added all eight stadiums hosting the games to the "3D Buildings" layer of Google Earth. 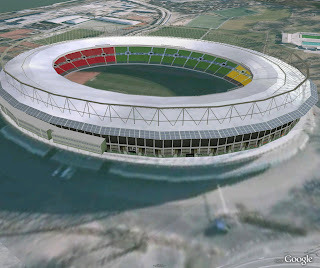 Click on any of the buildings for information about the stadium, including the matches scheduled to be held there. The info bubbles associated with each stadium also link to the 23 Days website which contains other tools that are essential for fans.